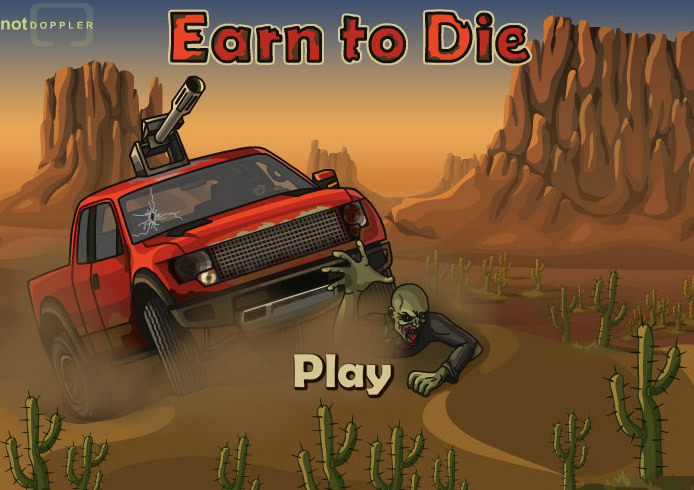 Earn to Die 1 is an addicting action game made by Armor Games. 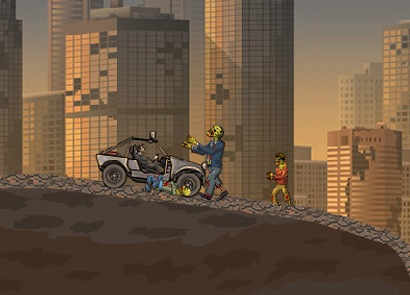 Set in a period where a zombie apocalypse has ravaged the planet, the game’s simple story has you, a survivor trapped in a zombie-infested area. The main character spots a helicopter in the distance and realizes that this is the chance he’s been waiting for to escape. 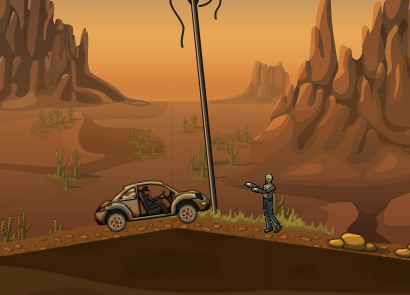 Zombies block his path to the helicopter and he realizes that he’ll need a car. Three cars are flashed on the screen. These are the three cars you’ ll be using in the whole game. The small hatchback, the old good pickup, and the cool heavy truck. Controls for all cars are the same throughout the game regardless of what car you’ll be currently using. Up key moves the car forward. Down key moves it back. Left key tilts it up and right key tilts it down. X key gives it a boost of speed but only when you get the speed boost upgrade.Keep the car balanced and moving with these controls. The whole game starts with your first car, the small hatchback. It is small, compact, and is generally, an adequate car considering the circumstances. 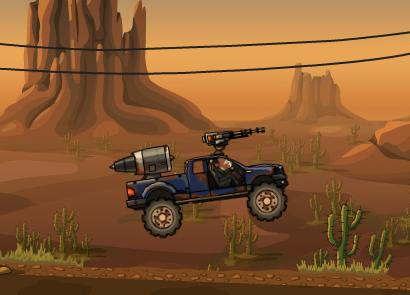 You will drive it and run over all the zombies you see. Run over them and just generally plow over them as they’re fair game. Don’t be alarmed if you notice on your first tries that you’re just moving a few meters from your starting point. That’s natural as the gas and fuel tanks would not have been upgraded yet. The important thing is that you’re earning money in this way. And with each attempt at escape, you’ll always be earning money. Immediately use this money to purchase all the upgrades for your car that you can get your hands on. Don’t scrimp your money. Go all out and spend your money on the upgrades as it’s the only way to slowly inch your way to the helicopter. These are the upgrades that you’ll need to purchase. They will vary in name and appearance with each car, but they will be the same function-wise. This is used to give your vehicle a speed boost. It will not be immediately necessary but as you progress you’ll see it’s significance. An essential upgrade. Upgrade the fuel and the fuel tank. Also essential because the only way to move in the game is with fuel. No fuel and the car stops. Used to traverse the rocky and often rugged terrain. Better wheels mean more distance travelled. The heart of your vehicle. Used to make it run. You’ ll need good engines to keep your cars moving. Mounted weapons that will automatically fire at zombies. 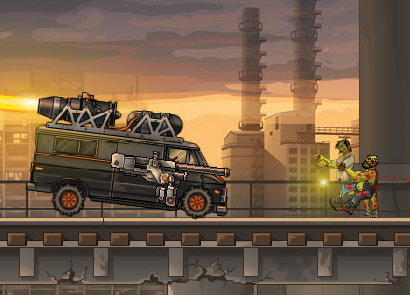 While also important, it’s best to get the other upgrades first and perhaps get this last, as you can easily run over zombies and earn money anyway. As you progress and get all these upgrades, you’ll notice a barrier will stop you automatically. It’s a pile of boxes that are almost impenetrable for the first car. For this reason you’ll have to upgrade to the pickup. The process of earning and upgrading parts starts again. 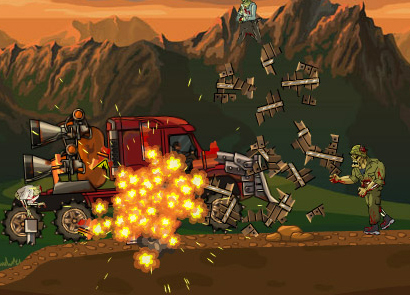 This all continues till you purchase the truck and eventually smash your way to the helicopter and to freedom. A challenge mode is unlocked after you finish the story mode above. 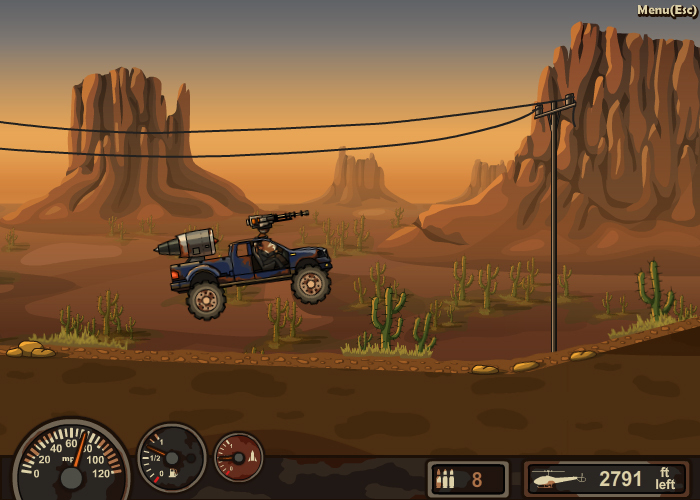 This whole process of driving, upgrading, and smashing obstacles and zombies is very rewarding and satisfying. 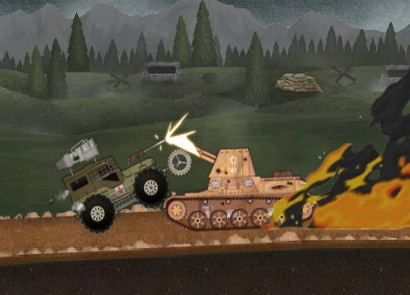 It’s this core gameplay that will have you playing this game over and over till you finish it. This is the essence of Earn to Die. A simple and rewarding fun game. Enjoy playing it but perhaps it’s best that teens play it. The presentation is cartoon-like, but the subject matter is a bit violent for kids. But other than that enjoy running over zombies to your freedom!